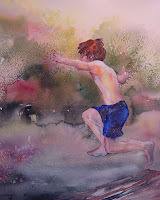 Our current show is "Rustic Ramblings"watercolors by Betty Bea Washburn. Betty Bea Washburn has been a professional watercolorist for the last 30 years. Before settling in northern lower Michigan, Betty Bea was a public school art teacher in the Marshall Public School system. Today she finds inspiration for her large and vibrant watercolors in area landscapes, gardens and historical sites, especially those on Mackinac Island. Washburn is intrigued by watercolor relationships: the harmony between the physical properties of the medium, the effect of atmosphere on the subject matter, and the use of color to create an internal glow. Her watercolor journey which included study under Nita Engle, has led to an intuitive style of painting achieved by floating color on paper surface and pouring atmospheric colors to achieve glowing light effects. This show is open during regular gallery hours through July 5, 2010.